Karl Malden's beard is a highlight in a film where the stellar cast is unapologetically misused. Joke aside, but apart from Debbie Reynolds and especially her wonderful sing/dance sequence, James Stewart and Malden the rest of the cast progressively blends in what is a bland and stale film that grows more forgettable by the minute. Sure looks pretty, but barring the first sequence and aforementioned dance scene, the rest can easily be skipped. Beautifully shot and scored, though the politics are largely what you would expect for the early 60s. Worth viewing as an artifact, I suppose, especially of 1924-64 American attitudes. I counted one African-American person, a bartender on a steamboat IIRC, plenty of American Indians and a few Chinese. Hispanic people were represented briefly by the Mexican army, and there were probably a few I missed. Knowing what I know of post-annexation California, I would like to know who held title to Robert Preston's ranch before he did. Ford's segment is a masterpiece for all time; the rest... no comment. Em honra de Eli Wallach. Ó céus, este filme é plasticamente maravilhoso e tem tudo para ser uma obra prima, mas não é. E que fique bem claro que este é um filme mais do Henry Hathaway do que de qualquer dos outros diretores envolvidos. Holy crap, it's gorgeous. Almost so gorgeous I can overlook the flat dialogue, the standardised plot(s) often copied straight from better movies (High Noon? ), the miscast actors, the parodic voice-overs that make it all sound like a commercial... It's just too big and too gorgeous to fail completely, but that only goes so far. Lame! Points for cinerama and the seconds showing Lee van Cleef. About the prettiest pictures, better use of locations ever, biggest production and 2nd unit efforts ever, and Alfred Newman heaven. And what a beautiful country. You can do worse. Cinerama looks incredibly ugly on a TV screen. Terrible. I don't know if this is a parody or not but it stinks. Pretty, very pretty. Both ladies and scenery. But too. Long. From the minute James Stewart is no longer on the screen it just gets worse and worse. Depressing with such a cast. 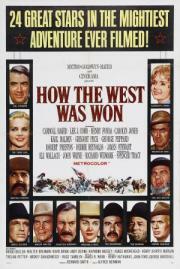 Eli Wallach, Henry Fonda, etc. are all very good, but are in the film for like 5-10 minutes each. Hell, Lee van Cleef isn't even credited and has no lines. The late John Ford really wasn't going anywhere. Blu-Ray made it possible to watch it in the intended Cinerama depiction. Stunning and gripping movie! Not one second was it boring. An awesome image is hunted by the next. A feast for the eyes! A waste of great talent. Great cast, good story, good score, but something felt lacking.